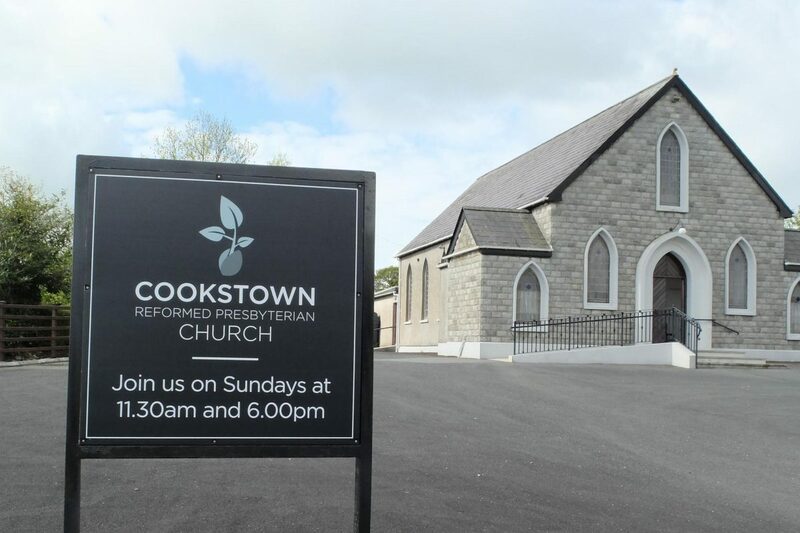 Cookstown RP church plant is a little church. We haven’t got a ton of members (our current total stands at five adults, and six covenant children), we aren’t powerful or influential. In fact, there’s not much to commend us to the world around us at all. But while we aren’t majestic or praiseworthy ourselves, we are honoured to serve a mighty God who is. Since our church plant began in 2013, God has shown us his kindness and rich provision in so many ways. And last month, on Sunday 6thMay, we were able to celebrate yet another demonstration of his fatherly care as we began worshipping in our own building! The premises (156 Orritor Road, Cookstown), belonged to a brethren denomination called the Church of God but due to dwindling numbers and an ageing core group, they decided to stop their work last summer. Around this time, our church family had begun to pray for a place of our own while we continued to meet in the local community centre. Then, in the autumn, seemingly out of the blue, we received a call from the Church of God offering to sell us their premises. God graciously provided our wee church with a lovingly maintained building that was just one mile from our town centre, and all for an incredible price. He is truly able to give us more than we could ask or imagine! So this month, we were finally able to re-open the old church doors, praise God for the great acoustics and enjoy a whole day of fellowship, learning, food and prayer with our church family and some of our brothers and sisters from across the RPCI. We were also incredibly blessed and humbled to welcome a few of the Church of God folk to our services. These dear brothers and sisters have left an enduring legacy of faithfulness to the gospel, and we’re aware of the duty and privilege of following in their footsteps and continuing that legacy. And that’s why we’ve written this piece about our new church building. It’s not really about the building at all (although feel free to come and visit!). As church families, we can create a faithful legacy whether we gather in a house, a sports hall, a field or a purpose built building. Equally, we can easily allow our church buildings to become museum pieces or polished idols rather than places of active service to King Jesus. Please pray that as we rejoice in God’s provision, and in the many benefactors who made the building purchase possible, we don’t get side-tracked from our main aim of proclaiming the gospel in our area. Our town is full of nominal Christians, ‘churchy’ people who affiliate themselves with a local denomination but refuse to submit to Christ’s rule over their lives. Sometimes the task of sharing the gospel in our context seems daunting, so pray that we are faithful and bold for Jesus. Finally, pray that we would seek God’s glory above all else. At this stage in a church plant, the temptation to pray selfish, ‘little kingdom’ prayers is strong. We don’t want to just ask God to put more people in our building, or to give us ‘results’ because none of what we do should really be about us at all. Instead, pray as Mark Dever puts it, that God would use this “group of pardoned rebels…to display his glory, because they tell the truth about him…and look increasingly like him: holy, loving, united”. Soli Deo Gloria.